then this message is well worth reading. This Spiritual Power Breakthrough assists you in reaching enlightened states of spirituality, peace, and contentment! These are the words that best describe this important breakthrough program. A psychiatrist named Dr. David Hawkins conducted a 29-year study that demonstrated that the human body becomes stronger or weaker depending on a person’s mental state. He created a scale from 1-1,000 that mapped human consciousness. FURTHERMORE, HE DEMONSTRATED THAT THIS MAP CAN BE USED AS A BLUEPRINT TO REACH HIGHER STATES OF CONSCIOUSNESS, WHICH CAN BE IDENTIFIED SIMPLY BY APPLYING A SMALL AMOUNT OF PRESSURE ON AN OUTSTRETCHED ARM! Why all the excitement? In short, Dr. Hawkins’ discovery was so profound and far-reaching, it provided a completely new understanding of humankind’s journey in the universe. It revealed a clear method for calibrating each person’s level of spiritual enlightenment. It also gave us a scientifically formulated, easy-to-follow roadmap to help us reach higher levels of enlightenment faster and more easily than anyone in history ever has before this discovery! Learn which foods, environments, companies, books, etc. are harmful (i.e., low energy) and which are beneficial (high energy). Learn how people who calibrate high on the Map of Consciousness can raise the energy and calibration of thousands of others just by being in their presence! Dr. Hawkins’ research is based on a well-established science called kinesiology, which has to do with the testing of an all-or-none muscle response stimulus. A positive stimulus generates a strong muscle response, and a negative stimulus results in a demonstrable weakening of the test muscle. Clinical kinesiological muscle testing as a diagnostic technique has been verified widely over the past 25 years. This phenomenon occurs independently of the test subject’s knowledge or opinion! It’s been proven cross-culturally in any population, and the results have been consistent over time! So for the first time in history, we have an objective basis for separating truth from falsehood – a basis that has been verified over 29 years’ time with randomly selected, naive test subjects. Not only that, but this simple method has also been demonstrated to be an effective tool for instantly calibrating human consciousness. Hawkins created a scale of consciousness based on current discoveries in advanced theoretical physics and the nonlinear dynamics of chaos theory. And this Map of Consciousness now can help anyone advance toward higher levels of enlightenment faster than you ever thought possible! The implications run even further, because Hawkins’ map identifies a critical point at which force becomes power, and when that happens, all of humanity benefits. YES, I want to become spiritually enlightened. The British colonized India, and when they did so, they were motivated by self-interest and exploitation. They calibrated to the level of pride at 175 on the Map of Consciousness. Gandhi, who calibrated at the enlightened level of 700, was able to defeat the entire British Empire because his position on the Map of Consciousness was one of far greater power. The British Empire represented force, and whenever force meets power, force is eventually defeated. It’s been demonstrated over and over again throughout history. The awareness of the difference between power and force, combined with the awareness that power is much stronger, can have broad implications for you as an individual and for society and the world. When we want to change ourselves or someone else or the government or even the world, the easy answer is to focus on increasing our power. 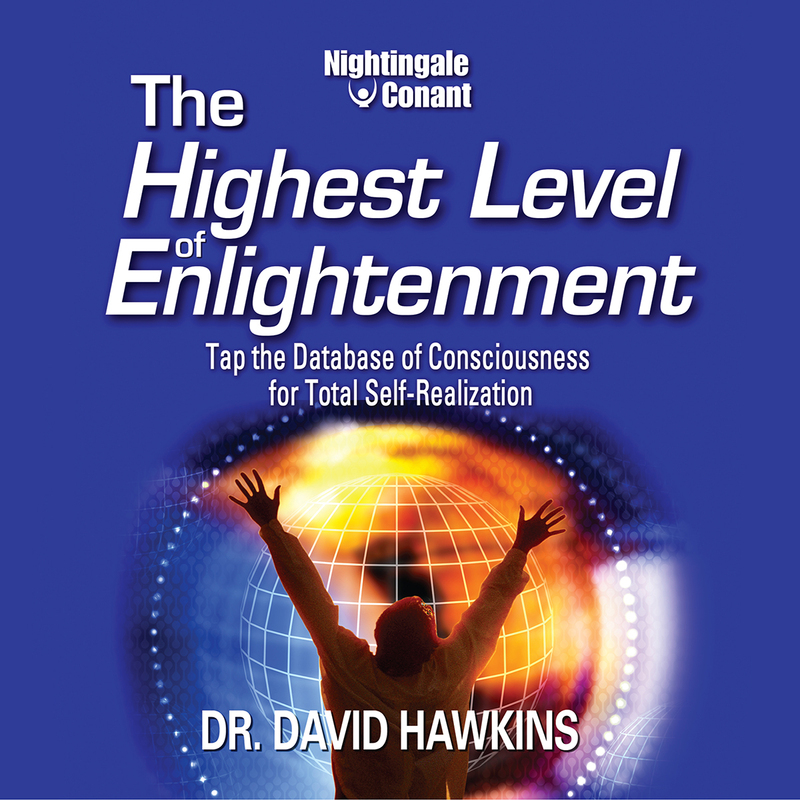 And in Dr. Hawkins’ audio program entitled The Highest Level of Enlightenment – Tap the Database of Consciousness for Total Self-Realization, you will learn how to do just that. Advance your level of consciousness and your understanding of all human behavior, just by learning the Map of Consciousness. Discern the reality of “near death” or “out-of-body” experiences - fact or fiction? Efficiently advance industrial, scientific, and medical research to achieve rapid breakthroughs. Differentiate powerful attitudes and concepts from weak ones. Discover the secrets of athletic prowess. Discover how to improve your health and wellness, as well as how to reverse the aging process. Learn how 85% of the world’s population falls below the level of integrity and how it is counterbalanced by the 15% that calibrate above the level of 200. Learn how the level of man’s consciousness stood at 190 for centuries and has now jumped to 207, with major implications for the human race. Obtain answers to questions that are beyond the world’s current state of knowledge. Discover the basis for all knowledge and how to access it. Differentiate the subjective from the objective and thereby transcend both time and space to reach the realm of absolute certainty. Calibrate the level of truth of any teacher, set of teachings, philosophy, religion, or government. Differentiate between a cult and a legitimate spiritual group. Detect fallacies in history both recent and ancient. Eliminate needless avenues of research and instantly detect the most fruitful focus of inquiry. Easily resolve complex business issues and decisions. Resolve doubts about the fidelity of a relationship, employees, business associates, lawyers, accountants, earnings statements, contracts, and customers. Identify the truth or falsehood about any statement or any event. Instantly know the genuineness of art or antiques. Instantly know the honesty of any business, investment, politician, witness, crime suspect, etc. Ascertain the degree of integrity and level of consciousness of any person living or dead. Discover the secret power that can be experienced by surrendering your personal agenda to the divine. Can you do all this and more using nothing more than an outstretched arm? Amazingly, YES! Over 29 years of scientific research spanning millions of calibrations and people from every nationality, belief system, and walk of life have demonstrated the veracity and effectiveness of this easy method. You could discover whether a house you’re considering buying has any secret problems the seller isn’t telling you about. You could learn how your behavior in any given situation affected a personal relationship, and then using the Map of Consciousness, you could increase your power and improve your outcome the next time! You could experience higher levels of enlightenment without going through all the hard work and difficulties of traditional spiritual practices. You could know instantly whether a new subject that catches your fancy is worth pursuing. You could determine which charitable cause is most deserving of your generous donations. The possibilities are endless. When Dr. Hawkins first encountered kinesiology, he was amazed at the endless possibilities. It was the “wormhole” between two universes – the physical and the mind and spirit – an interface between dimensions. What was even more exciting to him was that all its benefits could be visibly and irrefutably demonstrated. The great tragedy of human life in his view was that people were so easily deceived; all the discord and strife in the world have come because of mankind’s inability to distinguish the false from the true. But now The Highest Level of Enlightenment answers this fundamental dilemma. It recontextualizes the nature of consciousness itself and explains very clearly what otherwise could only be guessed at. Follow this fascinating journey, and you’ll see how simple it can be to raise your consciousness to the levels of power. It is a journey you will never forget, and your life will never be the same after trying it. Dr. Hawkins is no slouch either. He has embarked on his own fascinating journey of enlightenment and he shares the details of that journey with you in the program. Just know he is someone you can trust. Beginning work in psychiatry in 1952, Dr. Hawkins is a lifetime member of the American Psychiatric Association. During his 50 years as a psychiatrist, Dr. Hawkins published original research with Nobel Prize winners that helped revolutionize psychiatry. He received the Huxley Award, and in 1995, he was knighted by the Danish Crown. Over the years he has lectured at Westminster Abbey, Notre Dame, Harvard, Oxford, and many other major universities in the United States and other countries. He is currently a member of the steering committee of the Unity School of Divinity. So you are dealing with a well-respected psychiatrist with impeccable credentials, a person who has discovered a mind-blowing spiritual breakthrough that now makes it possible for the highest levels of enlightenment to be reached by average people. It truly can change the world, and you can take part in the early stages of its impact by ordering your copy of The Highest Level of Enlightenment – Tap the Database of Consciousness for Total Self-Realization. Once you do, you will discover what the excitement is all about and why there is more hope for the world and for each of us now than there has ever been at any point in history. For the first time, we have a legitimate science of spiritual advancement. We have a clear path to spiritual power and we also have a clear strategy that, if followed by enough people, can end war and other problems that have plagued the world since it began. In our personal lives, we have an effective method for improving our relationships and getting the results we want. We have for the first time a way to determine the truth or falsity of anything we are faced with. And that will empower us to take giant leaps forward in our spiritual progress, as well as prevent others from deceiving us or taking advantage of us. Open the door to new levels of spiritual power and try this out. You won’t regret it. I want to become spiritually enlightened!